LAS VEGAS, April 4, 2013 – Durst, the world’s leading manufacturer of wide-format production digital printing platforms, has dramatically raised the abilities of production-level digital printing with the introduction today of its new Rho 1012 and Rho 1030 Continuous Inkjet Production Systems. The Rho 1012 – equipped with Durst’s new high-performance 12-picoliter Quadro Array print head technology – brings exceptional image quality to the production printing environment. The Rho 1030 – complemented by fully automated media handling / operating configurations – delivers unprecedented print speeds of up to 10,000 s.f./hr. The Rho 1012 will be shown this week at the ISA Sign Expo in Las Vegas, alongside the 126- inch Rho P10 320R UV Inkjet Digital Roll-to-Roll Printer – in Booth 1515, where Durst will demonstrate its breakthrough VariodropTM printing technology, with very important implications for grayscale printing (see accompanying press release). Also at ISA, April 4-6 at the Mandalay Bay Convention Center, Durst is teaming up with Zund America and Caldera to demonstrate a complete digital production workflow – from ripping to printing to cutting – in real time on the show floor. Durst’s and Zund’s booths are located next to each other, and attendees will be able to follow a job from creation to completion. The Rho 1000 has proven itself as the most productive wide format UV inkjet-printer offered in the market, and the 1012 and 1030 further its productivity and application sets, said Dr. Richard Piock, CEO of Durst Phototechnik AG. 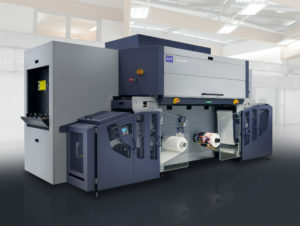 The Rho 1000 platform has provided a high-productivity solution along with flexibility as it relates to the configuration options available to users – either run in a fully automated stack-to-stack board printing option, fully registered 3⁄4 automation, roll- to-cut sheet or roll-to-roll configuration. The 1012 and 1030 benefit from new advancements in print technology combined with these proven automation solutions, he said. The Rho 1012 offers customers the highest print quality available in the segment, featuring the new 12-picoliter Durst Quadro® Array technology that can print at speeds up to 5,000 s.f./hr. The small drop technology implemented represents unrivalled quality at these print speeds, giving the user the ability to meet the quality and volume requirements normally reserved for high-end lithographic applications. 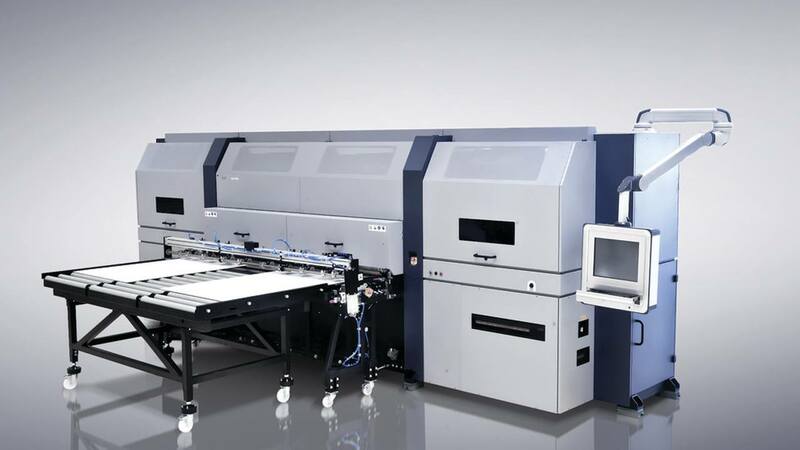 The Rho 1030 takes the production curve even further along the large-format digital print run spectrum, with production speeds up to 10,000 square feet per hour. This speed combined with the printer’s fully automated configurations gives customers a long-run volume, large-format UV inkjet printing capability that provides high quality for their requirements. For a more in-depth explanation of its “path forward,” the capabilities of its industry-leading printers, and its new Variodrop technology, Durst is conducting a press conference at 2:00 p.m. (pdt) Thursday, April 4, in Room Coral C of the Mandalay Bay Convention Center. Howard and other Durst executives will be on hand to make the presentation and field questions from members of the press. The 126-inch Rho P10 320R establishes a new quality standard for industrial roll-to-roll printing. Precision components developed by Durst include a proprietary magnetic linear drive carriage system for efficient, accurate printing. Image quality is ideally suited for any high-visibility backlit application. The Rho P10 320R also prints directly onto textiles and stretch media. Productivity of up to 1,650 s.f./hr. is enhanced by the printer’s ability to print two 1.6m rolls of material side by side, with different images on each. With a single large roll, the Rho P10 320R can operate uninterrupted. Durst Phototechnik AG is a leading manufacturer of professional digital imaging systems. 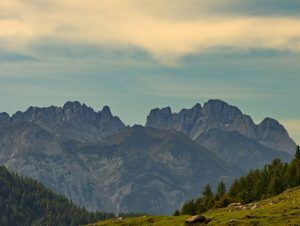 The company operates manufacturing facilities in Brixen, Italy, and Lienz, Austria, and has major offices in the U.S., France, United Kingdom, Germany, Spain, Mexico, Brazil and Singapore. The Durst reputation for quality, precision, innovation and reliability spans more than 70 years.